Hot cross buns! Hot cross buns! Any takers? I’ve got a hot tray full of them and looking to share. Time to stuff your faces with these little buttery spice pillows. There are many stories, myths and traditions surrounding hot cross buns and I could did spend an entire day reading about them. Here are my favorites. 1. Share a hot cross bun with another person to enjoy a strong friendship and bond for the next year. An old Irish rhyme states, “half for you and half for me, between us two good luck shall be”. So let’s share this tray of hot cross buns I’ve got. Can you hear them calling your name? 2. They stay fresh for a whole year. Surely these spiced hot cross buns that are making our flat smell so nice are going to be devoured ASAP. 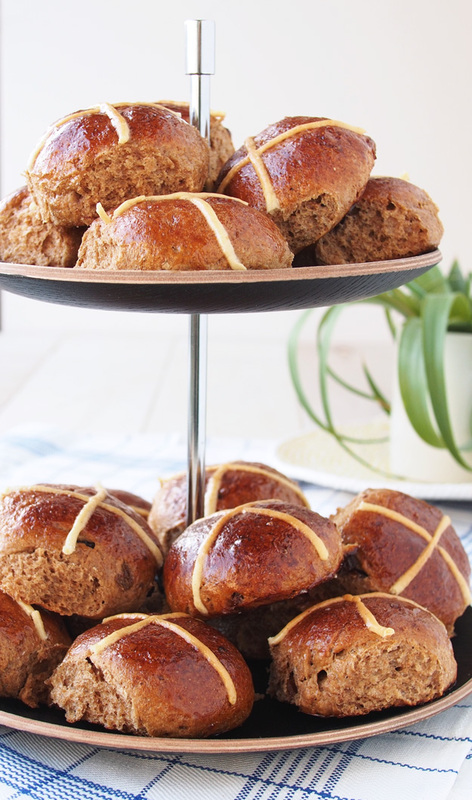 But legend has it that if you hang a hot cross bun from your kitchen rafters on Good Friday, the bun will remain fresh and mold-free throughout the entire year. 3. Hanging a hot cross bun in the house on Good Friday offers protection from bad luck in the coming year. If you can resist eating hot cross buns fresh out of the oven, and are not worried about the potential mold that might grow on it, hanging it for a year can also protect you from bad luck! 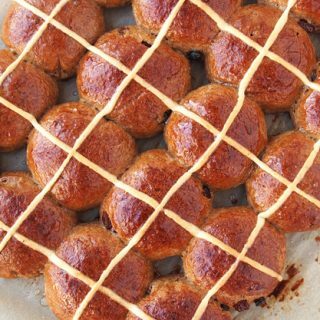 The thought of eating all these hot cross buns as soon as I’m done writing this post is still much too tempting though. 4. The cross on the buns represents the rebirth of the world after winter, the four quarters of the moon, the four seasons, and the wheel of life. [Warning: GOT reference] Winter is coming …. But after winter, we can all sit down and have hot cross buns! 5. The cross on the buns can also represent the Crucifixion. As with many other pre-Christian traditions, Christians replaced the pagan meaning of the cross with a Christian one – the resurrection of Christ at Easter. 6. Joy the Baker refuses to make hot cross buns from scratch. 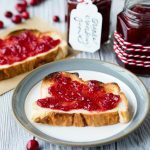 She has no hot cross bun recipe, but you can find other hot cross recipes on her site — Hot Cross Pancakes and Hot Cross Biscuits. *Fingers crossed* for a hot cross donut from her this year. 7. Emma from Poires au Chocolat made hot cross buns 4 years in a row and documented and shared each version of the recipe. She writes about the tweaks she made between each version and researches the tough questions on the origins of hot cross buns. You can find her most recent recipe (version 4) on the front page of her now archived ‘book’ of recipe. 8. Hot Cross Buns being played on the recorder is one of the catchiest tunes. If you’re a bit nostalgic for school days and playing the recorder, here’s a little treat for you. Don’t say I didn’t warn you if the tune gets stuck in your head! Here’s my recipe for sprouted spelt hot cross buns. The spelt flour gives these buns a darker color and a toasty taste. I love baking with spelt flour because this ancient grain is healthy and delicious. It creates baked goods with a rich flavor, and it is not as dense as whole wheat flour. The recipe also uses coconut palm sugar to reduce the amount of refined sugar typically in these indulgent treats. I’m off to polish off the tray that as been making me salivate. Can you restrain yourself until Good Friday to make these? 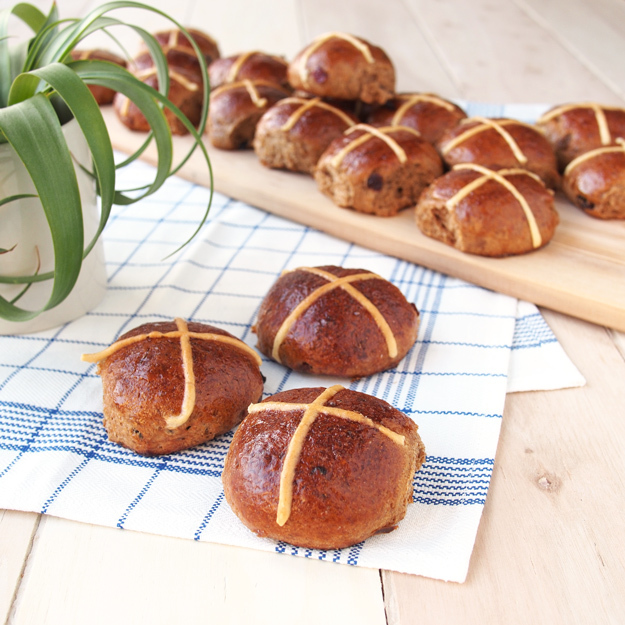 These spiced spelt hot cross buns are delicious served warm. Sultanas, dried currants and dried cranberries fill each of the soft buns. Be sure to allow time for these buns to rest and rise. In a small bowl, add in the milk and coconut palm sugar. Heat in the microwave for 30-45 seconds to warm. Mix well to dissolve the coconut palm sugar. In a large bowl, mix together all the dry ingredients, except for the dried fruits, orange zest and salt. 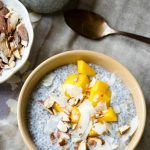 Make a well in the middle of the bowl and add in the milk and egg. Mix together until it forms a rough dough, then add in the butter one cube at a time while kneading the dough with your hands. Continue kneading for about 5 minutes, until you have a smooth dough. Add in the dried fruits, orange zest and salt and continue kneading for about 3 more minutes until the dried fruits are well dispersed. Place the dough back in the bowl and cover with a tea towel. Leave it in a warm place for about 1 hour, until it almost doubles in size. When the dough is ready, punch it down and divide it into 20 equal sized pieces (50g each). Roll each piece into a smooth ball. It is very important that you roll each piece until it is smooth, and there are minimal cracks on the surface of the balls. You can follow this technique. Arrange the buns on a baking tray lined with baking parchment, keeping an even gap of about 1/2 inch (1 cm) between each of the buns. Cover the tray with a lightly oiled plastic wrap. Let the buns rise in a warm place for about 1 hour, until they have almost doubled in size and the sides of the buns are all touching. When they are ready, in a small bowl, whisk together the egg, egg yolk and milk. Brush the buns carefully with the eggwash and leave it out to dry for 10 minutes. Brush again. You won't need all of the eggwash, but make sure you get the eggwash into the cracks and edges of the buns. Preheat the oven to 390°F/200°C. Combine all the ingredients in a small bowl and mix until a smooth thick paste forms. Start by using only 2 tablespoons of milk and add more as needed. Fill a piping bag with the mixture and cut a small hole. Slowly pipe a line along each row of buns, then repeat in the other direction to create crosses. Make sure you pipe slowly, so the topping "hugs" the curves on each bun. 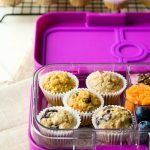 Place the tray into the oven and immediately turn the oven down to 360°F/180°C. Bake for about 20 minutes until the tops are golden brown. While the buns are in the oven, in a small saucepan, add in all the ingredients and bring to a boil. Immediately turn down the heat and simmer, until a syrup forms. Remove from heat and spoon out the spices. Once the buns are ready, brush them with the hot syrup. Wait 5 minutes and brush again with the syrup. Allow the buns to cool for about 15 minutes before serving. Recipe adapted from Gail's bakery. 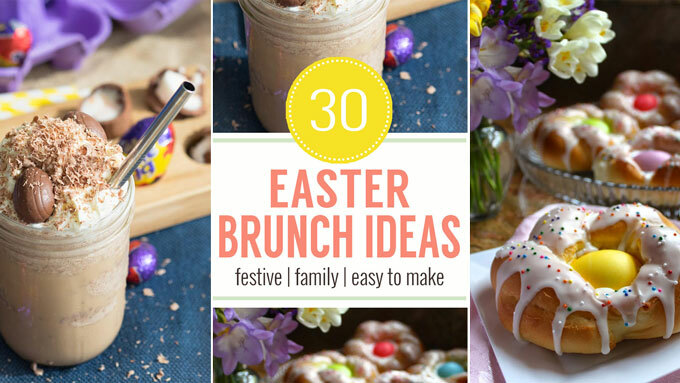 30+ Easter Breakfast and Brunch Ideas for you and your family. 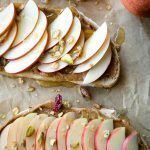 Rude Health provided me with the Sprouted Spelt Flour and compensated me for the ingredients used in this post. I love the blue checkered tea towel and vintage off-white cup from Minor Goods. 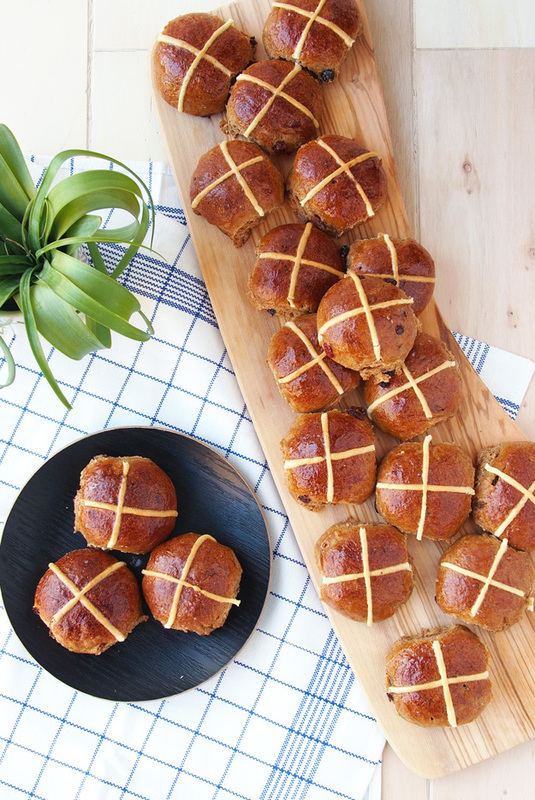 How completely delicious, I love hot cross buns and the spelt flour twist sounds awesome. 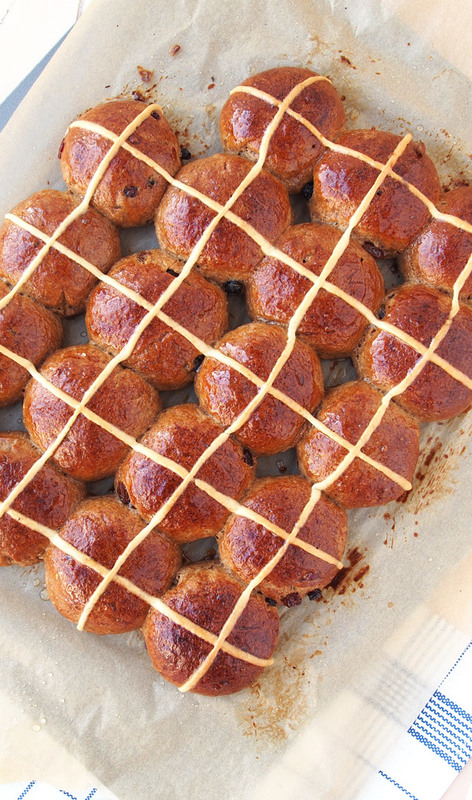 These hot cross buns look perfect! 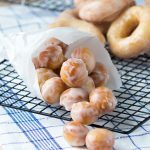 I love the idea of spelt flour, something I have never heard of but I can imagine how the toasty flavor elevates these babies to an entirely new level. Beautiful job with these! Thanks, Nagi! Hehe, I was actually thinking of a post that you did on FBC when I came up with that. 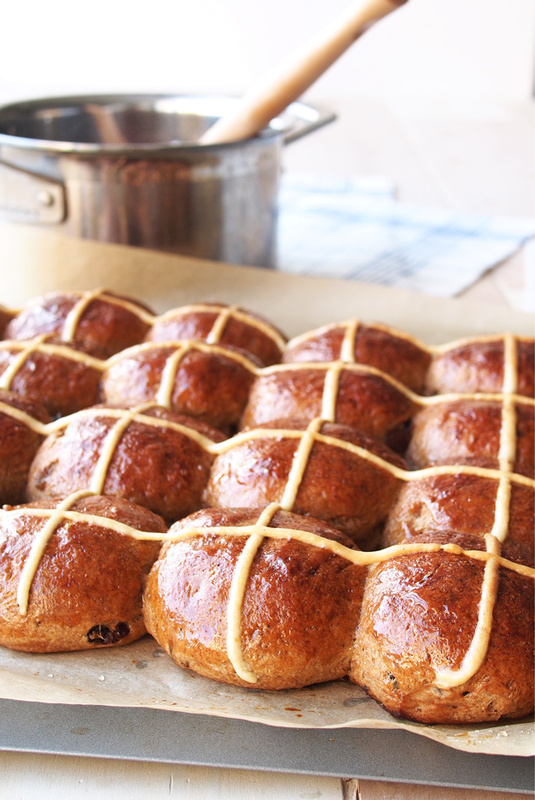 Hope you’re getting your fill of hot x buns this season.. half a week left! These look so good. 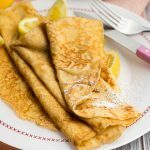 I’ve been wanting to try cooking with spelt flour because I want a simple and healthy alternative to wheat. 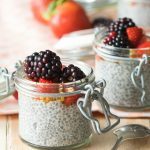 How does sprouted spelt flour differ from the regular kind? Hi Nicole! Yes, you should give spelt flour a try. It bakes very nicely and can be substituted in for plain flour easily. Sprouted spelt just means it has been “activated”. I wrote a bit more about it on my Sprouted Buckwheat Waffle post. 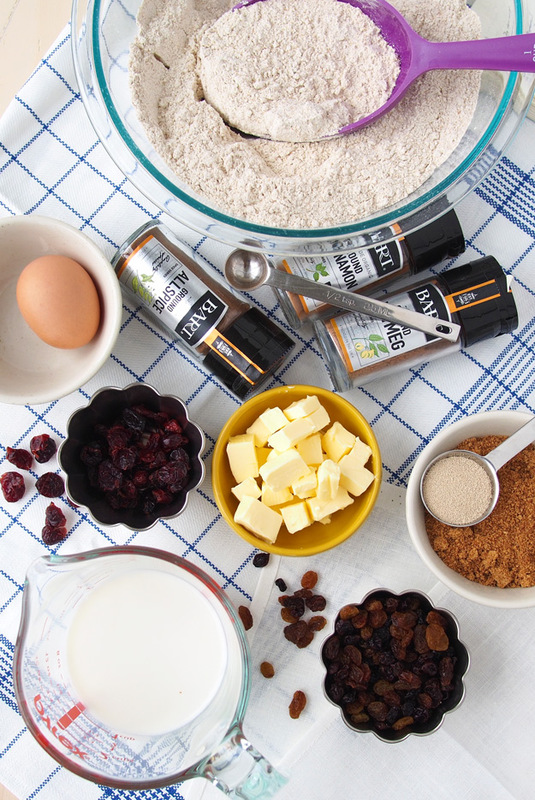 Enjoy cooking and baking with spelt! My mom always used to take us to get hot cross buns for breakfast a local bakery during Lent. Your version looks so delicious. I want to eat them all! Thanks! 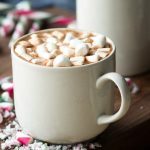 :) Are you making any this year? 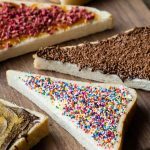 Any good ones from bakeries in Chicago? These turned out so beautifully! As many times as I’ve sung the “hot cross buns” song throughout my childhood, would you believe I’ve never eaten a single hot cross bun?!! This might be the year to finally change that and make a batch to share with our family over Easter weekend! Yours look stunning! Thank you! Hot cross buns are everywhere in the UK, but I don’t remember seeing them as much in the US. They are so tasty though, so definitely give it a try!